Yesterday, President Donald Trump announced the largest revocation of protected areas in U.S. history. The two proclamations he signed removed protections of more than 2 million acres by eliminating both Bears Ears and Grand Staircase-Escalante national monuments and replacing them with five much smaller national monuments. His illegal action could result in the destruction of Native American archaeological sites, widespread loss of wildlife habitat, and economic harm to local businesses. In actuality, Bears Ears and Grand Staircase-Escalante national monuments are already American-owned public lands intended for public use. These monuments are not owned by any single community but rather shared across the entire nation and protected on behalf of current and future generations. Instead, both proclamations signed by President Trump open all newly unprotected lands to oil drilling, coal mining, uranium extraction, and other industrial activities. If those extractive uses move forward, it will come at the expense of activities Americans now enjoy in the monument, such as hiking, hunting, and fishing. This is just flat wrong. The original monument proclamations explicitly allow for hunting, fishing, and the continuance of existing grazing. Furthermore, all national monuments honor existing leases for oil, gas, and coal. National monument protections are a boon for rural economies—not a drag as President Trump and U.S. Secretary of the Interior Ryan Zinke suggest. Public lands and national monuments support the $887 billion outdoor recreation economy. Economists have found that rural Western counties with more protected public lands, including national monuments, have faster-growing populations, employment rates, and personal incomes than those with less protected land. Since Grand Staircase-Escalante’s designation in 1996, per capita incomes have risen 28 percent and employment has risen 40 percent in the communities adjacent to the national monument. Additionally, Secretary Zinke’s own briefing materials indicate that grazing inside of Grand Staircase-Escalante National Monument has not changed since the late 1990s, when it was initially protected. And sportsmen’s groups have continually advocated for protecting prime hunting lands as national monuments to ensure high-quality habitat is maintained into the future. Presidents of both parties have used the Antiquities Act of 1906 to protect some of America’s most prized outdoor spaces. Indeed, nearly half of America’s 59 national parks were first protected or expanded as national monuments by presidents under the Antiquities Act. The Grand Canyon, Olympic, Acadia, Arches, and dozens of other national parks were first protected by the law. Monuments generally preserve current uses of the land, including tribal access for traditional plant and firewood gathering and for ceremonial purposes, off-highway recreation on existing routes, grazing, hunting and fishing and water and utility infrastructure. Bears Ears is a tribal monument, declared at the request of and with the support of five sovereign tribal nations with deep cultural and spiritual ties to the land. The five tribes worked tirelessly to conserve Bears Ears as a national monument, finally protecting around 100,000 cultural and archaeological sites, which had been under ongoing threat of vandalism and looting. It is explicitly written in the original Bears Ears monument proclamation that traditional tribal uses should continue as they had. 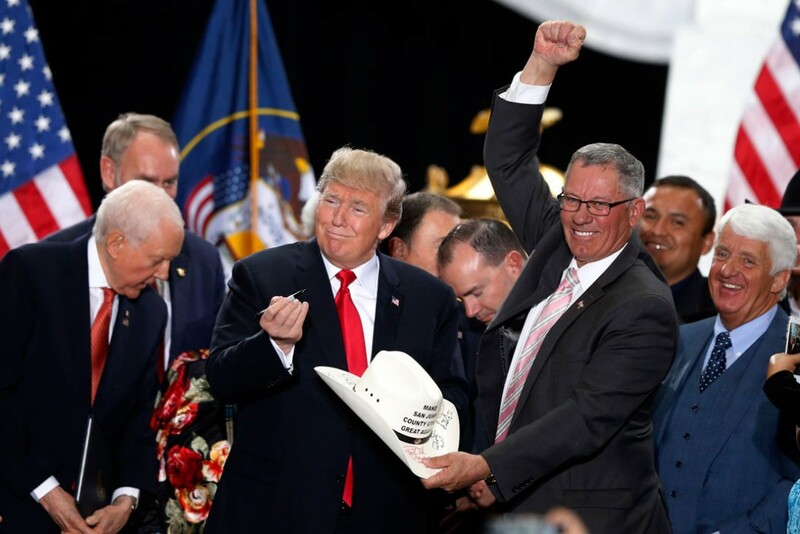 Immediately following Trump’s announcement, the Navajo Nation issued a statement expressing deep disappointment in the action and noting that they will be filing a legal challenge to the action. This is a sky-is-red, water-is-dry, upside-down argument from an alternate universe. With his action, President Trump ordered the largest elimination of protections for public lands in the country’s history. Eliminating 85 percent of Bears Ears National Monument, including lands with tens of thousands of Native American ruins and artifacts, will remove protections from national treasures. President Trump’s action to eliminate protections for national monuments is remarkably controversial, unprecedented, and will immediately face court challenges from the tribal nations and other groups. Legal experts overwhelmingly agree that no president has the legal authority to eliminate monument acres. More than 2.8 million Americans—98 percent of all comments submitted in response to Secretary Zinke’s review—asked the president and the secretary to leave these monuments alone. Sovereign Native American tribes, small businesses, hunters, anglers, and outdoor recreation companies all oppose the president’s action. The authors would like to thank Lauren Kokum for her contributions to this column.